The Hoos slogged along in a scoring slump of four minutes and counting. Host North Carolina picked up steam with a 10-0 run, fueled in part by UVA’s recent issues with turnovers. The home fans grew increasingly fervent with each passing moment. A blocked shot in transition, a Tony Bennett timeout, and a media timeout had yet to quell the tide. In fact, Bennett’s timeout had been followed by a missed 3-pointer and a turnover trying to save an offensive rebound as well as a 3-pointer from Carolina’s Coby White. So yes, the Hoos were reeling down 49-43 and they needed to respond. The initial response came courtesy of a De’Andre Hunter pull-up jumper to end that scoring drought. 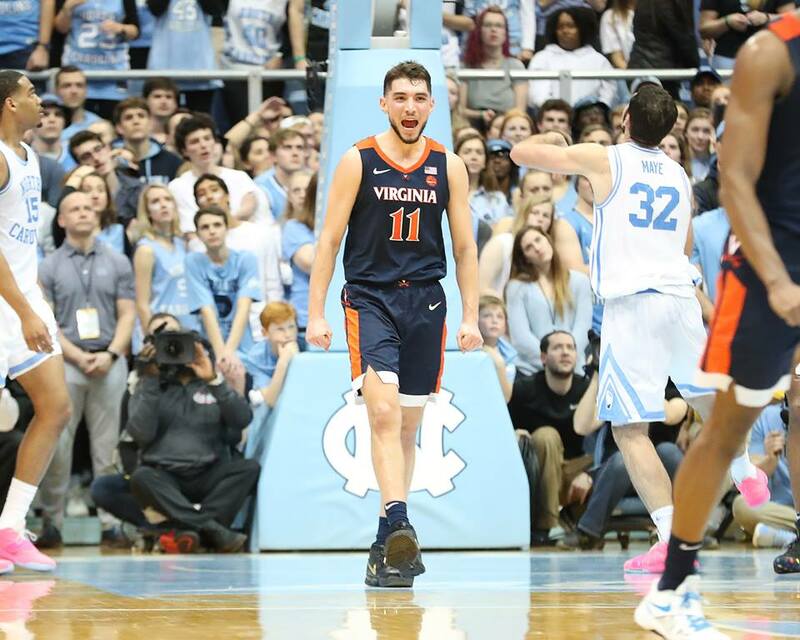 The full answer finally came in the form of Virginia’s big three scorers and some rediscovered defensive determination. The Cavaliers rallied with a strong final 11 minutes and grabbed the win in Chapel Hill as a result, 69-61. Virginia showed that resolve in the final 11 minutes. On the heels of the Heels’ 17-3 surge to take that lead after trailing by seven at halftime, UVA outscored UNC 21-6 as part of a game-closing 26-12 stretch. Early in the comeback attempt, the Hoos had to overcome seven-point leads twice at 53-46 and 55-48. They found a way. That 55-48 deficit disappeared quickly thanks to a 7-0 surge from the visitors. Jerome drove and shuffled a pass back to Kyle Guy for an open 3-pointer near the top of the key to start it. Then Jerome drove to earn free throws (he made one) and he spotted up for a 3-pointer of his own in transition moments later on a pass from Hunter. The game settled into two more ties at 57-57 after UNC’s Garrison Brooks and Jerome traded buckets and at 59-59 after two free throws from Brooks and a driving basket from Hunter. After a shot clock buzzer beater turned into a violation upon review to squelch potential momentum for Carolina, the Cavaliers delivered their final answer. Hunter drove to the basket and found Jay Huff for a layup to break the tie with 3:12 to go. Moments later, it was Guy’s turn again. First, he sprinted off a Huff screen and made a 3-pointer in the right corner to make it a two possession game. Then after Brooks scored for UNC, Guy followed with another triple from the right wing to push the lead to two possessions again. The Cavaliers wrapped it up from there. Guy finished with 20 points on the strength of 5-of-9 shooting from 3-point range. He moved past Gene Engel (1,071 points) into 44th place on the program’s all-time scoring list during the game and took over seventh on the career 3-pointers made list from Sammy Zeglinski (200). Guy now has 202 triples and 1,078 career points. Hunter also had 20 points to go with 5 rebounds, 2 assists, 1 blocked shot, and 1 steal. Jerome, meanwhile, posted 15 points and 11 assists, his second career double-double. The other one came in the rivalry game with Virginia Tech last month. The trio combined to hit 19 of 32 shots (59.4%), which accounted for 55 of the team’s points and helped the team hit 53.3% of its shots overall. Diakite tallied 6 points and 4 blocked shots in the win. That 35% number came courtesy of a strong defensive effort, particularly over those final 11 minutes. After White’s 3-pointer pushed UNC out to a 49-43 lead entering the final 11 minutes, the Tar Heels made just 4 of 20 shots. That 20% finishing stretch featured two blocked shots by UVA and three turnovers from Carolina too as the Cavaliers seemed to turn up the wick defensively. White led the Heels with 17 points on 6-of-19 shooting with 2 assists. Cameron Johnson added 16 points on 6-of-14 shooting to with 7 rebounds and 3 assists, while Brooks had 12 points, 8 rebounds, and 3 assists. Kenny Williams chipped in 9 points and 5 assists. Luke Maye finished with 4 points on 2-of-10 shooting to go with 11 rebounds. That wasn’t enough to hand the Hoos back-to-back losses following Saturday’s setback to Duke. Instead, Virginia snapped North Carolina’s seven-game winning streak.